Rattlesnakes are pit vipers and include the genera Crotalus and Sistrurus. Pit vipers may be identified by a heat-sensing pit anteroinferior to the eye. Rattlesnakes may be identified in all but one species by a rattle at the tip of the tail. Rattlesnakes are indigenous from North America to South America. See the image below. Juvenile southern Pacific rattlesnake (Crotalus oreganus helleri). Photo by Sean Bush, MD. Venom is usually injected into subcutaneous tissue via hollow movable fangs located in the anterior mouth. Occasionally, intramuscular or (probably rarely) intravenous injection occurs. Rattlesnake venom is generally composed of several digestive enzymes and spreading factors, which result in local and systemic injury. Clinically, local effects most commonly predominate, progressing from pain and edema to ecchymosis and bullae. Hematologic abnormalities, including defibrination with or without thrombocytopenia, may result, but serious bleeding is uncommon. Local or diffuse myotoxicity may result in complications such as compartment syndrome  or rhabdomyolysis. Other general effects include shock, myokymia/fasciculations, taste changes, and vomiting. Rarely, direct cardiotoxicity or allergy to venom may occur. Some rattlesnakes may exhibit neurotoxicity with minimal local tissue effects (see Mojave Rattlesnake Envenomation). A large percentage of bites occur when a snake is handled, kept as a pet, or abused. These are considered intentionally interactive bites. Many bites are associated with ethanol use. An estimated 300,000-400,000 venomous snakebites occur per year. Although rattlesnakes are not found naturally outside of North America, Central America, and South America, they are imported into zoos, museums, and private collections in other regions of the world. Males are bitten more commonly than females. Before antivenom, estimates of mortality rates ranged from 5-25%. Since the development of antivenom, rapid EMS transport, and emergency/intensive care, mortality rates have improved to less than 0.28% when antivenom is administered and to 2.6% when antivenom is not administered. Less specific figures are available for morbidity data, although most patients recover fully after rattlesnake envenomation. The best estimates suggest that rattlesnake envenomation results in tissue loss, deformity, or loss of function in approximately 10% of patients. US mortality with administration of antivenin is approximately 0.28%. Without antivenin being administered, mortality is approximately 2.6%. Call professionals, such as animal control, to move snakes (if it is necessary to move the snake). Bailey AM, Justice S, Davis GA, Weant K. Delayed hematologic toxicity following rattlesnake envenomation unresponsive to crotalidae polyvalent antivenom. Am J Emerg Med. 2017 Jul. 35 (7):1038.e1-1038.e2. [Medline]. Tincu RC, Ghiorghiu Z, Tomescu D, Macovei RA. The Compartment Syndrome Associated with Deep Vein Thrombosis due to Rattlesnake Bite: A Case Report. Balkan Med J. 2017 Aug 4. 34 (4):367-370. [Medline]. Gummin DD, Mowry JB, Spyker DA, Brooks DE, Fraser MO, Banner W. 2016 Annual Report of the American Association of Poison Control Centers' National Poison Data System (NPDS): 34th Annual Report. Clin Toxicol (Phila). 2017 Dec. 55 (10):1072-1252. [Medline]. Wingert WA, Chan L. Rattlesnake bites in southern California and rationale for recommended treatment. West J Med. 1988 Jan. 148(1):37-44. [Medline]. Corbett B, Clark RF. North American Snake Envenomation. Emerg Med Clin North Am. 2017 May. 35 (2):339-354. [Medline]. Ruha AM, Kleinschmidt KC, Greene S, Spyres MB, Brent J, Wax P, et al. The Epidemiology, Clinical Course, and Management of Snakebites in the North American Snakebite Registry. J Med Toxicol. 2017 Dec. 13 (4):309-320. [Medline]. Sotelo-Cruz N, Gómez-Rivera N. A retrospective review of rattlesnake bites in 100 children. Minerva Pediatr. 2017 Apr. 69 (2):121-128. [Medline]. Spyres MB, Ruha AM, Kleinschmidt K, Vohra R, Smith E, Padilla-Jones A. Epidemiology and clinical outcomes of snakebite in the elderly: a ToxIC database study. Clin Toxicol (Phila). 2017 Jul 13. 1-5. [Medline]. Norris RL Jr. Snake Venom Poisoning in the United States: Assessment and Management. Emerg Med Rep. 1995. 16:87-94. Langley RL, Morrow WE. Deaths resulting from animal attacks in the United States. Wilderness Environ Med. 1997. 8:8-16. Norris Jr RL, Bush SP. North American venomous reptile bites. Auerbach PS, ed. Wilderness Medicine. 5th ed. 2006. Bush SP, Jansen PW. Severe rattlesnake envenomation with anaphylaxis and rhabdomyolysis. Ann Emerg Med. 1995 Jun. 25(6):845-8. [Medline]. Bond RG, Burkhart KK. Thrombocytopenia following timber rattlesnake envenomation. Ann Emerg Med. 1997 Jul. 30(1):40-4. [Medline]. Hurlbut KM, Dart RC, et al. Reliability of clinical presentation for predicting significant pit viper envenomation. Ann Emerg Med. 1988. 438-9. Bogdan GM, Dart RC. Prolonged and recurrent coagulopathy after North American pit viper envenomation (abstract). Ann Emerg Med. 1996. 27:820. Boyer LV, Seifert SA, Clark RF, McNally JT, Williams SR, Nordt SP, et al. Recurrent and persistent coagulopathy following pit viper envenomation. Arch Intern Med. 1999 Apr 12. 159(7):706-10. [Medline]. Burgess JL, Dart RC. Snake venom coagulopathy: use and abuse of blood products in the treatment of pit viper envenomation. Ann Emerg Med. 1991 Jul. 20(7):795-801. [Medline]. Riffer E, Curry SC, Gerkin R. Successful treatment with antivenin of marked thrombocytopenia without significant coagulopathy following rattlesnake bite. Ann Emerg Med. 1987 Nov. 16(11):1297-9. [Medline]. McBride KM, Bromberg W, Dunne J. Thromboelastography Utilization in Delayed Recurrent Coagulopathy after Severe Eastern Diamondback Rattlesnake Envenomation. Am Surg. 2017 Apr 1. 83 (4):332-336. [Medline]. Carroll RR, Hall EL, Kitchens CS. Canebrake rattlesnake envenomation. Ann Emerg Med. 1997 Jul. 30(1):45-8. [Medline]. French WJ, Hayes WK, Bush SP, Cardwell MD, Bader JO, Rael ED. 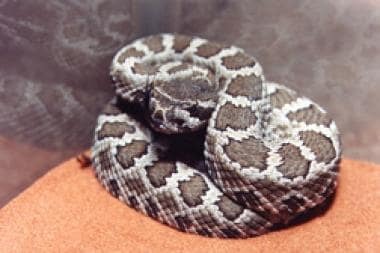 Mojave toxin in venom of Crotalus helleri (Southern Pacific Rattlesnake): molecular and geographic characterization. Toxicon. 2004 Dec 1. 44(7):781-91. [Medline]. Bush SP, Green SM, Laack TA, Hayes WK, Cardwell MD, Tanen DA. Pressure immobilization delays mortality and increases intracompartmental pressure after artificial intramuscular rattlesnake envenomation in a porcine model. Ann Emerg Med. 2004 Dec. 44(6):599-604. [Medline]. Hardy DL, Bush SP. Pressure/immobilization as first aid for venomous snakebite in the United States. Herpetol Rev. 1998. 29:204-8. Consroe P, Egen NB, Russell FE, Gerrish K, Smith DC, Sidki A, et al. Comparison of a new ovine antigen binding fragment (Fab) antivenin for United States Crotalidae with the commercial antivenin for protection against venom-induced lethality in mice. Am J Trop Med Hyg. 1995 Nov. 53(5):507-10. [Medline]. Bush SP, Wu VH, Corbett SW. Rattlesnake venom-induced thrombocytopenia response to Antivenin (Crotalidae) Polyvalent: a case series. Acad Emerg Med. 2000 Feb. 7(2):181-5. [Medline]. Bush SP, Green SM, Moynihan JA, Hayes WK, Cardwell MD. Crotalidae polyvalent immune Fab (ovine) antivenom is efficacious for envenomations by Southern Pacific rattlesnakes (Crotalus helleri). Ann Emerg Med. 2002 Dec. 40(6):619-24. [Medline]. Baudou FG, Litwin S, Lanari LC, Laskowicz RD, Damin CF, Chippaux JP, et al. Antivenom against Crotalus durissus terrificus venom: Immunochemical reactivity and experimental neutralizing capacity. Toxicon. 2017 Dec 15. 140:11-17. [Medline]. Jurkovich GJ, Luterman A, McCullar K, Ramenofsky ML, Curreri PW. Complications of Crotalidae antivenin therapy. J Trauma. 1988 Jul. 28(7):1032-7. [Medline]. Clark RF, Selden BS, Furbee B. The incidence of wound infection following crotalid envenomation. J Emerg Med. 1993 Sep-Oct. 11(5):583-6. [Medline]. Guisto JA. Severe toxicity from crotalid envenomation after early resolution of symptoms. Ann Emerg Med. 1995 Sep. 26(3):387-9. [Medline]. Offerman SR, Bush SP, Moynihan JA, Clark RF. Crotaline Fab antivenom for the treatment of children with rattlesnake envenomation. Pediatrics. 2002 Nov. 110(5):968-71. [Medline]. Premawardhena AP, de Silva CE, Fonseka MM, Gunatilake SB, de Silva HJ. Low dose subcutaneous adrenaline to prevent acute adverse reactions to antivenom serum in people bitten by snakes: randomised, placebo controlled trial. BMJ. 1999 Apr 17. 318(7190):1041-3. [Medline]. A recent study suggests that the Extractor (Sawyer Products) does not reduce swelling after rattlesnake envenomation and may be associated with skin necrosis beneath the suction cup. Photo by Sean Bush, MD. Moderate rattlesnake envenomation in a toddler after treatment with antivenom. Photo by Sean Bush, MD.